Click here to order these posters. 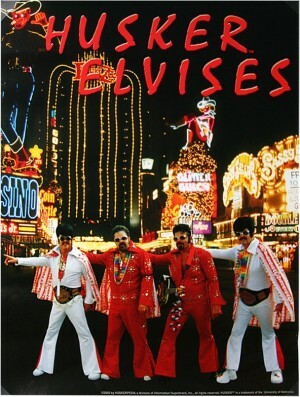 The Husker Elvises group is made up of the four Brew brothers (Larry, Steve, Ron and Gerry). Dressing up in Husker Red and white Elvis jumpsuits, wigs and capes they show up at Husker games to cheer on Big Red, promote team spirit, entertain and make fans laugh. Also known as the Brew Crew, they were born and raised in Alliance, Nebraska. They are goodwill ambassadors for Husker football and seek to build fan spirit for the Husker Nation during football games and throughout the year. DM Whose idea was it to start your group? HE Gerry - Actually, at Tom Osborne's finale in 1997, Ron and I went down to Miami for the Orange Bowl. Growing up we were always big Elvis fans and frequently sang Elvis and did impersonations. Arriving in Miami, we put the Elvis glasses on, and went to the game, the fans just loved it. The Miami fans loved it, the Nebraska fans loved it, and the Tennessee fans loved it - it was a hit on all cylinders. It was a joke that took on a life of it's own. So, then we started singing after that, we put the guitars in, and put the whole mix together. DM So how many games do you do this in a year - where all four of you get together? HE Larry - It varies. Two to three regular season games and we usually do the post-season game. We’d like to do more but we’re kind of spread around the Midwest. I live in Ft. Collins, CO. Steve in Alliance. Ron in Omaha. Gerry in Madison, Wis.
DM I remember the first time I saw you was at the Fiesta Bowl in 2000 at the Millennium block party. You guys were really popular then. HE Larry - It’s taken on a life of it's own. My three brothers have always been characters. We all live, breath and love Husker football. I remember the time when Coach Osborne won his first national championship. It had been such a long drought with many close calls before Tom won the big one. My father-in-law called me up two minutes before the game was over and I suddenly realized we were going to finally win the BIG one. I was so emotionally wound up I started to cry on the phone. It’s truly more than just a game or just a football team - it's a way of life. It’s a sense of identity for us. We’re proud of our state and our roots. Since Husker football is really the only show in the state – it’s the unifying symbol of what we are as a state - Nebraska football is the tie that binds us together, not just as us brothers but as a ‘state bond’. We are always trying to promote positive interaction when we go out as Husker Elvis, both to Husker fans as well as our opponents. Elvis recognition is everywhere you go, and we probably get a thousand positive responses for every negative response. All fans love Elvis and they learn to love our team too, so we're kind of on a goodwill ambassadorship mission. Ron - I've read where different fans say Husker Nation is kind of a fraternity, and others have said football in Nebraska is a religion. We eat, drink, sleep, breathe, live and love Husker football. We're die-hard fans and I never miss a game if I can help it. I thought about quitting my job a couple of times when I had to miss a game. It's interesting because Gerry was the President of a Fortune 1000 company. He was going to come down to Lincoln, we had plans for the Notre Dame game and his boss, chairman of the board, said, "Well, we're going to have a meeting - you can't go." Gerry said "I will tender my resignation before I miss this game" so they rescheduled the meeting. One other thing I wanted to say is besides Nebraska football games; we've gone to charitable organizations and fundraisers. We performed at a fundraiser for a youth group called the Explorers, and we've performed at retirement homes. We've done individual things as well as a group, so we're kind of goodwill ambassadors for the team and try to represent them well, but also to "spread joy throughout the land." DM Which one is the oldest? HE Larry - 53 - I live in Ft. Collins, Colorado and I am the Quality Manager for Hach Water Quality Analysis Equipment. DM Larry, when was your first Husker game? HE Larry - My first Husker game didn't occur until I was a senior in college. I came to Lincoln with a friend who had a spare ticket. We went with his girlfriend and another girl - that was back in '72 when I believe Rich Glover was playing, but I have religiously been listening to the Huskers since 5th grade. It was Devaney's first year. I would turn on the radio every Saturday afternoon and listened to the games in our kitchen. As far as I was concerned the sun rose and set with Nebraska football. Sometimes before big games I would have trouble sleeping at night. Even now I listen to the game via Coloradoans for Nebraska radio. DM Steve, how old are you? HE Steve - I'm 52 - I'm in train service in Alliance - my first Husker game was probably when my wife and I flew out and went with Ron and his wife Judy - in the 80's - when we played Colorado and they came back and beat us. DM When Eric Beinimey got the score at the end? DM Who's the next oldest? HE Ron - - I'm 29 and holding. Actually I'm 50. Let me ask you a question - (jokingly)"Is this outfit too much, hey look at me?" I'm a Manager for Union Pacific Railroad, the largest railroad in the world. I live in Omaha. I've lived there for about 20 years. We all grew up in Alliance. DM Steve, when was your first Husker game? and I think he brought it back for a touchdown or he had a pretty good return - that was in about '71. HE Gerry - I'm the baby (he's spoiled too) and I was CEO of the world's largest neuro-surgical instrument company for many years and now I'm the Vice-Chairman of the American Academy of Neurology and I do venture investments. I live in Madison, Wisconsin. I'm actually entertaining a bid run for the Governor of Wisconsin. I've never had political aspirations but if Schwarzenegger can get elected then Elvis probably can too. DM So when was your first game? HE Gerry - my first game was 1972 and it was the Colorado game which was in Johnny Rodgers time. I was a sophomore in high school. Where we grew up, out west in Alliance, it was very remote and I remember, in our day, listening to the Nebraska games on the radio up in our tree house from the time I was five years old. In the early Devaney era you had only one or two Husker games a year on TV in the regular season so it was a big deal for us when Nebraska would be on TV. The team has provided so many memories, I recall when Churchich was quarterback in the 60's, I remember the amount of excitement when Nebraska tied USC, I can remember the Orange Bowl games against Alabama, the 1969 Sun Bowl and of course the great teams of 1970 and ’71. As a kid, I recall just being glued to the TV at age 6, 7 8, watching every play and it was so much fun. I think we've gone to probably 20 different states doing Husker Elvis. It's been a lot of fun. 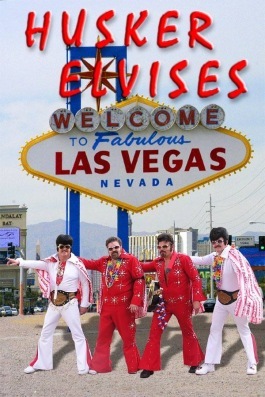 When we did the National Championship game in L.A., we went out to Vegas and did Elvis on the strip on New Year's Eve. We got four or five comical news clips from that. I also did a piece for the Discovery Channel at the Sturgis Bike Rally last summer. The Bikers and their mamas really liked the King of Rock and Roll. We had a family reunion in July and we performed about a 1-1/2 hour show for sisters, family and their friends. They live on a farm and they invited all their neighbors; we set up a semi-stage on the front apron of the garage area and everyone sat out there and did the Huskers cheer. HE Larry - We met Jay Norvell (Husker’s offensive coordinator) at the 2005 Spring Game and he graciously invited us to entertain the coaching staff and friends at a 4th of July pig roast this summer. It was such a great time! We met and took pictures with Tommie Frazier, coach Callahan, Jay and his friends. They are such good people and want to put Nebraska back on the winning track. We took this opportunity to induct Coach Callahan and Coach Norvell into the Husker Elvis family. We have a humorous ‘swearing in’ ceremony that everyone gets a big laugh out of. Bill and Jay put on Elvis glasses with the fake sideburns. They even let the crowd in a rousing version of “Viva Cornhuskers (Las Vegas)”. They are now the honorary president and vice president of our support group. We feel very honored by this gesture. Now if we can just get Steve Peterson inducted as Husker Elvises CEO! Sometimes when we're downtown, we'll be singing and we'll have contests for little kids to see who can dance and give the best Husker cheer, things like that and then we give them a lei or flashing ring. I'm always amazed at how people react, from 8 to 80. It's a lot of fun. DM Tell me more about the other charity events that you've done. HE Steve - I probably did a dozen things this summer - a couple of 80-year old birthday parties, three or four reunions, class of '59, '63, '74. The other thing we're doing - last winter there's as a guy in my hometown in Alliance who had Downs Syndrome his whole life. He had worked at McDonald's there for 13 years and he had had six months to live so they had an event for him and called it a retirement party. They asked me to do a skit and we did the party for him. He had a ball and then he died nine days later. I've had some church fundraisers, things like that. Larry, Ron and I did one last fall in Ft. Collins this fall and in November we did one for the local Catholic school. They had an auction and the theme is Las Vegas so we fit right in. Ron does an annual casino night fundraiser for St. Joan of Arc in Omaha and other local events. HE Gerry- And even in Colorado, we're still a Husker Elvis there. It's kind of ironic, last fall Larry and Ron went to the Colorado game, and of course those fans are very hostile and I had somebody come up to me at Sturgis and they said they couldn't believe how well we defanged the Colorado fans by being classy, by not taking trash, by talking about the good things of the teams and the Colorado fans loved Elvis. They couldn't believe how we handled it. HE Larry- Yes, while Ron and I were at the Colorado game, ‘Buffalo Chip’, their mascot wanted to have his picture taken with us. So we went over to him. When we first stood by him everyone in the crowd started cheering for Buffalo Chip and Elvis. Then they realized which team Elvis was representing and you could hear them saying, "Wait, those are Husker Elvis’ don’t cheer for them! '“ (Laughter). HE Ron- Oh yeah, I went into the bathroom and there were these young kids in there giving me a bunch of crap, and I said, "Hey, can't we all just get along". We are over in other countries fighting, can we try to get along at home here?" And they all looked at me and backed off. They go, "Hey, we didn't mean anything." ....Or when somebody says something, you say, "Do you kiss your mother with that mouth?" (Lots of laughter...) We have had some great times. DM Tell me about your swearing in ceremony. HE (Ceremony) Raise your hands and repeat after me - I, (state your name), do solemnly swear to uphold the principles set forth in the Husker Elvis handbook, to be of good cheer, in good seasons and in bad, to laugh and joke, to sing and dance, to rock and roll, to raise our children and our children's children as Elvis Presley brotherhood and sisterhood fans, all in good faith, to the utmost of our ability, we find these virtues to be self-evident, as Elvis is my witness, so help me Bob. By the power that is invested in me by Bob Devaney, the King himself, the state of Nebraska, the city of Memphis, Tennessee, the FBI, the CIA, the CDC, the FDA, the NAACP (laughter), I proclaim you members of the brotherhood and sisterhood of the Husker Elvis family. Now you may consummate the vows with the double bump of the hip or the chest. DM Thanks guys for taking the time to do this interview. It was a lot of fun and I look forward to seeing all of you at Husker games for years to come. You can email feedback on this article to this email address.